Mila Olson has played flute and piccolo with the Folsom Lake Symphony since 2012. She holds an M.A. degree in flute performance from San Jose State University where she studied with Isabelle Chapuis of the Paris Conservatory, and a B.M. degree in flute performance and music education at CSU Sacramento where she studied with Laurel Zucker. Mila is a founding member of the Sacramento Flute Club and currently serves as its treasurer and assists with the direction of the club’s flute choirs. She is the music teacher at Camino School, teaching general music to third through fifth grades and band to fifth through eighth grades. 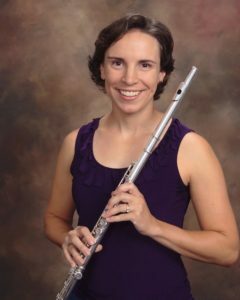 Mila also teaches private lessons at El Dorado Hills Music and performs locally with the Camellia City Flute Choir.